Numerous connectors and pins live on your motherboard. We take you on a tour of the most commonly used slots, connectors, and pinouts. 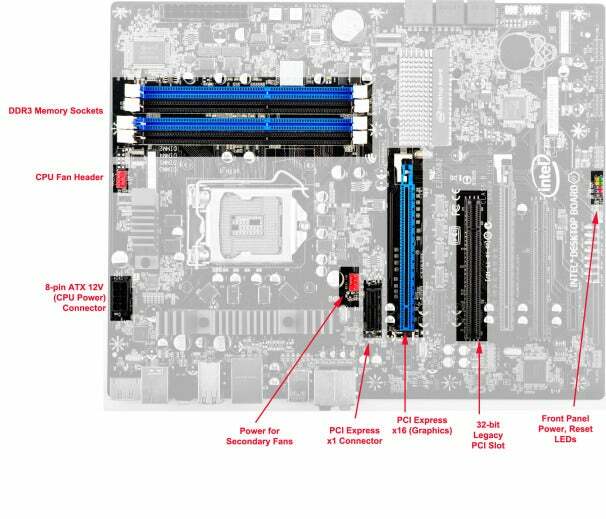 If you've ever opened a PC case and stared inside, or looked at a bare motherboard, you may be taken aback by the number and variety of connectors, pins, and slots that exist on a modern PC motherboard. In this guide I'll identify some of the most common (and a few uncommon) connectors on motherboards used in most home PCs. I won't cover server- or workstation-class boards here, just what you might find in a typical midrange or high-end home PC. For a similar discussion of the ports that you're likely to encounter on the exterior of a PC case, see "Multiple Ports on Your PC: What Do They Do for You?" Since no single motherboard contains every type of connectors, I've used photos of four different boards to illustrate key examples. In one or two instances, there is some overlap; but for the most part, connectors are mentioned only once. Many of them may exist across different motherboard designs, however. Let's start with an older motherboard, an Asus P5WDH Deluxe. This motherboard has a few connectors that aren't included on current-generation boards, as wll as some that do are still included, but are more readily visible here. Connections on an older Asus P5WDH Deluxe motherboard. Audio front panel: This ten-pin connector links to the front-panel headphone and microphone inputs. The particular connector shown is an AC97 connector, which existed prior to multichannel HD audio. It's still in common use today. Azalia digital audio header: You rarely find this connector, used to tie the motherboard to multichannel digital outputs on the case, on current motherboards. Serial-port header: This connector isn't physically present on the board shown--you can just see the solder points for it. But this header does appear on a few modern boards. It supports a nine-pin, RS-232 serial port, usually as a bracket that occupies a slot space on the back of the case. A number of RS-232 connections remain in use today, mostly in point-of-sale devices or specialized test instruments. Consumer boards typically don't have them. FireWire (IEEE 1994a): Once common as a digital camcorder interface, FireWire has largely been supplanted by USB, and the motherboard makers are gradually phasing it out. Some professional audio hardware still uses FireWire, though; you may also occasionally find higher-speed IEEE 1394b headers, but they are even rarer. USB 2.0 front panel: These connectors are used to link to the front-panel USB ports on PC cases. SATA connectors: These components connect via cables to various storage devices, including hard-disk drives, solid-state drives, and optical drives. IDE connector: Rarely found today, IDE connectors were used to link to older hard drives. In addition, until a couple of years ago, many optical drives supported IDE. Today, all new storage devices ship with SATA. Floppy disk connector: The venerable 3.5-inch floppy disk drive survived for nearly two decades--an eternity in the tech universe. But unless you have a pile of old floppies, you won't need a floppy drive. And if you do find yourself needing a floppy drive, you can always pick up an external, USB-connected drive. Now let's examine a more recent motherboard: an Intel D67BG, based on Intel's P67 chipset and supporting LGA 1155 CPUs (like the Sandy Bridge-based Core i7-2600K). Intel D67BG motherboard: a modern Intel design. DDR3 memory sockets: Current-generation PC systems use DDR3 memory, but in many instances they support different operating speeds. The P67 chipset used in this board maxes out at DDR3-1600, but to achieve that level of speed you'd have to overclock the chipset--officially the P67 supports only DDR3-1333. Here, we see four memory sockets. The system supports dual-channel memory, meaning that the system is populated with paired memory modules, which are mounted in sockets of the same color. CPU fan header: This connector is specifically designed to link to the CPU cooling fan. The system BIOS monitors CPU cooling fan speeds; and if the fan isn't connected to this header, you may get an error at bootup. Eight-pin ATX12V (CPU power) connector: Back when the Pentium 4 processor first shipped, Intel realized that high-performance CPUs needed their own source of clean, dedicated power beyond what the standard 24-pin power connector could deliver. Thus was born ATX12V. You'll see four-pin connectors on lower-end boards supporting CPUs with lower thermal design power (TDP), but the eight-pin version of the connector is used with higher-end processors and on boards that users may overclock. Power for secondary fans: Many motherboards with secondary-fan power headers; these connectors are mainly used to power and monitor various case fans. PCI Express x1 connector: PCI Express is a serial interface, though multiple lanes may be ganged together. The "x1" refers to a slot supporting a single PCI Express lane; it is used for I/O devices that don't require bidirectional bandwidth greater than 500 megabytes per second (gen 1 PCIe). Sound cards, for example, are typically PCIe x1 devices. PCI Express x16 (graphics): PCI Express x16 slots are used mostly for graphics cards, though they can be used with any PCI Express card. Confusion may arise, however, because not all PCIe x16 slots are true PCIe x16. Occasionaly, you'll see PCIe x16 connectors that are physical slots for accommodating graphics cards, but are actually eight-lane (x8) or even four-lane (x4) electrically. 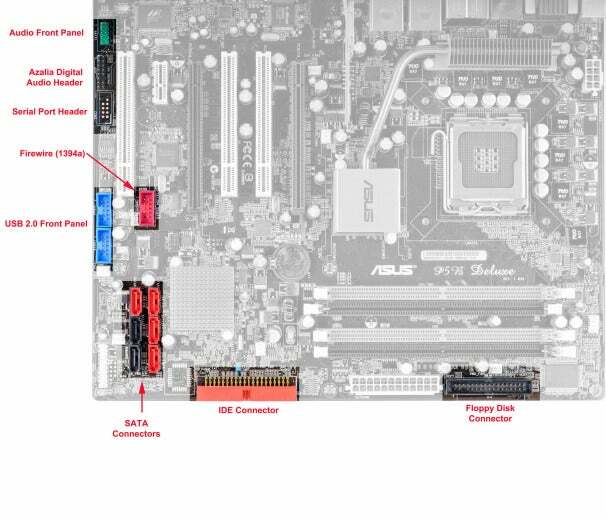 On some boards, even slots that support true 16-lane PCI Express for graphics may revert to eight lanes if you install a second graphics card into a second PCIe x16 slot on the motherboard. The P67 chipset, for instance, has only 16 total PCIe lanes for graphics. So if you drop in two graphics cards to run in dual GPU mode, each card will have just eight lanes available to it. This situation isn't as bad as it sounds, though, since even eight lanes in a PCIe 2.0- or 3.0-based system delivers plenty of bandwidth for most games. 32-bit legacy PCI slot: The now-classic 32-bit PCI slot has been around since 1993. A host of expansion cards support 32-bit PCI; and to accommodate them, most motherboards are likely to have at least one 32-bit PCI slot going forward. You may see some system boards configured so that a particular back-panel case bracket can support either a PCI slot or a PCIe slot, with some overlap between the two because they're very close together. Front-panel switch header: This header connects various wires to the front panel of the case, where they link to power and reset buttons, and status LEDs for power and storage-drive activity. Next we'll turn our attention to a motherboard that supports AMD CPUs. Note that AMD-chipset boards support many of the same features as Intel-based boards--that's the great thing about industry standards. 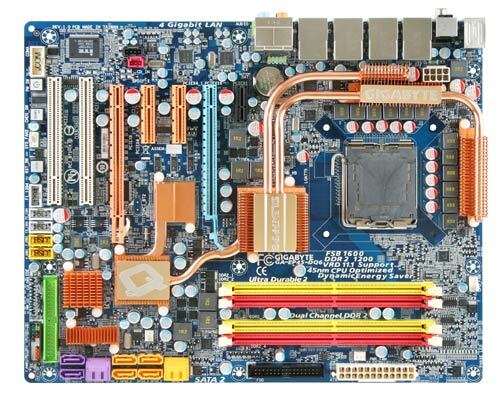 An AMD-compatible motherboard: the Gigabyte 990FXA-UD7. 24-pin ATX power: This connector exists on all current ATX-based motherboards, and is the standard means of connecting power from power supplies. This connector delivers power to all interfaces, including 3V, 5V, and 12V. The typical ATX12V version 2.3 PSU delivers up to 75W for PCI Express graphics cards; but numerous modern graphics cards need more than that, which is why you'll often find secondary six- or eight-pin power connectors on the graphics cards themselves. ATX4P: This unusual item is actually a SATA power connector for delivering power to SSDs, hard drives, or optical drives from the motherboard itself. TPM connector: Some off-the-shelf PCs and laptops use the Trusted Platform Module connector to link to a cryptographic processor module for storing encryption keys and handling dedicated encryption chores such as hard-drive encryption and certain types of digital rights management (DRM) decryption. USB 3.0 front panel: This connector is used to drive front-panel USB 3.0 connectors. It requires more pins than USB 2.0 connectors do, but it drives two USB 3.0 ports instead of one. If your PC case lacks a USB 3.0 internal cable, you won't be able to use it. Like back-panel connectors, front-panel USB 3.0 ports are often color-coded blue. AMD CPU socket: I'm calling out this component because its style differs from that of a modern Intel CPU socket. AMD CPUs still have pins, whereas Intel has moved the pins to the motherboard socket. I'm using a photo of just one section of this board, to call out some specific connectors and to get a little closer in. The Intel DZ77GA-70K motherboard is designed to accommodate the latest Intel Z77 chipset. Part of the Intel DZ77GA-70K--a motherboard that hosts the latest Intel Z77 chipset. Case fan header: As noted earlier, most higher-end motherboards have several of these fan headers scattered around the board. If enough of them are available, you should connect your fans to them, so that the BIOS can monitor and manage the fan speeds--unless you're a serious overclocker who uses separate fan-control modules. PCI Express x4 slot: This relatively rare physical and electrical PCIe x4 slot is used for higher-performance networking cards and for some storage controller cards. S/PDIF digital audio: This older type of connector was originally used to connect to CD-ROM drives. Today it's still used to connect to some optical drives and other audio devices that support S/PDIF (Sony/Philips Digital Interface) digital audio. 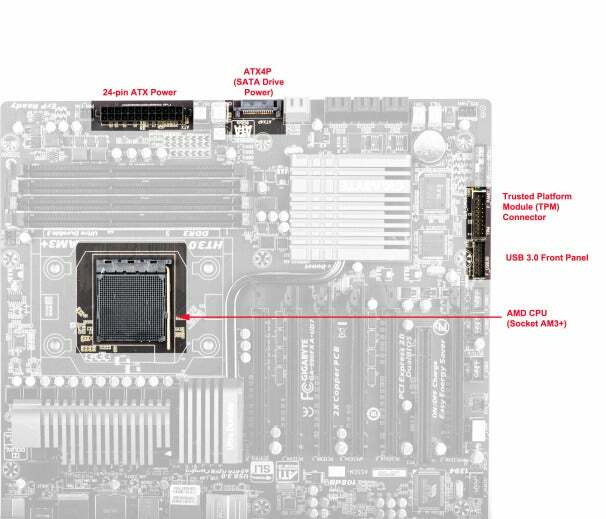 USB 3.0 front panel: The DZ77GA motherboard ships with two front-panel USB 3.0 connectors, driving up to four USB 3.0 ports on the front of the PC case. High-current USB 2.0 front panel: This is a slightly different type of USB 2.0 connector. Though it acts as a normal USB 2.0 port when sending or receiving data, it can deliver extra current to permit fast charging of mobile devices, and it can even charge devices (like Apple's iPad) that requires more current than standard USB 2.0 normally delivers. Consumer IR: This connector is used to attach front-panel infrared receivers, which enable users to control the PC via a standard programmable remote. Diagnostic LEDs: Most motherboards have simple LEDs that light up or change color if the board experiences problems. A few higher-end boards, however, have these status LEDs, which flash an alphanumeric code that helps the user narrow down the source of a boot problem. That wraps up our tour of various motherboard connectors, pins, and ports. Though I haven't covered all of the possibilities by any means, the ones listed here account for the vast majority of connectors you'll encounter on today's motherboards. Rarely will you use every single connector on a board, but understanding these connectors should help you choose a PC case that suits your needs, or that accommodates new devices that you plan to add in an upgrade. Also, if you have a specific need, you'll be better able to shop for a motherboard capable of handling your application.